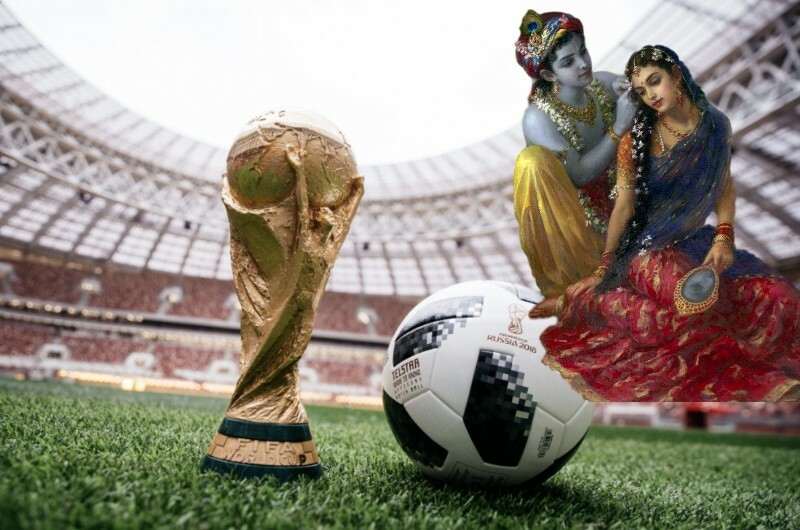 Here, I share six points that will enable the reader to broaden his or her vision regarding the relationship (if any) that exists between watching the World Cup and bhakti-yoga. Nationalism is a temporary designation; therefore rooting for “x” or “y” national team makes no sense. While we can say that rooting for one’s national team is natural, the number one lesson of the Bhagavad-Gita is that we are not our physical bodies. Our bodies are French, Belgium, British, Croatian, etc… But we, as souls inhabiting these bodies, have nothing to do with any national identity. 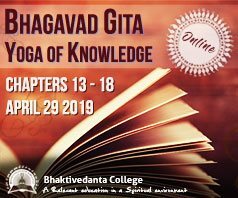 Krishna says in the Gītā (15.7) that we are His eternal parts and parcels, and the Caitanya Caritamrita (Madhya 20.108) further defines our ontological identity as eternal servants of the Lord. Therefore the show of loyalty towards a given country’s national football team makes no sense because such loyalty entails showing allegiance towards a temporary, or false, identity. When we further add the factor of reincarnation into this equation, a comical scenario can well be a reality: in one life, I can be situated in a French body, rooting for the French team, while in my next incarnation I may be in a Croatian body, rooting for Croatia. Not very intelligent. 2) For every World Cup winner, there’s a loser. Look at the faces of the players when each football match ends. While members of one team jump up and down, laughing and smiling from ear to ear — their fans roaring from the top of their voices, the losing team players, on the other hand, are down on their knees, their sweaty faces hiding in the palms of their hands — their fans watching in disbelief, tears gliding down on the national flags painted on their cheeks. The fact is that in the material world, win-win situations are rare, if not non-existent. A devotee feels sad watching the sorrow of the losing players and their fans. A symptom of a devotee is that he is sad to see the suffering of others. Watching the losing players and fans anguishing after a dramatic loss is painful to witness. Imagine that Griezman, Pogkba and the other French players raise the golden trophy on July 15th, having become world champions for the second time in history. Becoming world champions creates a sentiment of immortality, a feeling of being “forever” etched in the history books. How long will this victory last, though? Four years? Perhaps eight years if France miraculously wins back-to-back championships in 2022? And how long will the world care (or even remember) that France won the World Cup in 2018? In a broader, existential sense, a World Cup title cannot save anyone from the onslaughts of old-age, disease and death, which Krishna repeatedly reminds us of in His teachings. A World-Cup victory, in this sense, is illusory due to its temporary nature. According to the Bhagavad-Gita, all of us will be losers in the struggle for material existence within the cycle of birth and death. From a theological point of view, nobody wins in material life; we all lose. Bhaktivinoda Thakura prays, “Oh Gopinatha, I now give in and accept my defeat. All of my various endeavors have proved futile. Now You and You alone are my only last hope” (Sri Sri Kalyana Kalpa-taru, song four). Consequently, while feeling a sense of joy is natural for the winning team, we had better not forget the greater picture, namely that none of us are ever definite “winners” in the samsara cycle. 4) In the spiritual world, competition exists, but nobody is a loser; everyone is a winner. In spiritual competition, in the “competition lilas” of Krishna and His associates, everyone wins. As followers of Prabhupada, we can remember that Prabhupada sometimes included what he called “frivolous sports” in his definition of gambling. Hence we may feel reticence about playing or watching football. Indeed, when we compare watching a World Cup game to chanting twelve rounds of japa, the latter activity is more favorable for one’s spiritual advancement. And yet devotees do need recreation in their lives if they are to follow Krishna’s teachings in Bhagavad-Gita (6.17). For some devotees, watching a World Cup match is maya. For other devotees, watching a World Cup match is recreation. Teenage devotees (as well as older devotees) like to play football. Prabhupada himself admitted, “I played football when I was young.” He said, “I would be the goalie because I was lazy. I didn’t like to run around. That was the position I liked” (Srila Prabhupada Uvaca, 22). Whether one should or should not watch the World Cup is a matter of personal choice. 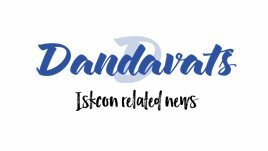 Devotees are situated in different age groups, in different ashrams, in different phases of their lives; they must accept and reject what they honestly and intelligently consider to be favorable and unfavorable for their life-long, sustainable Krishna conscious project. If they do watch the World Cup, they should try to remember Krishna while doing so — which brings me to my last point. Instead of being attached to which team wins the game, we can let go and just remember that Krishna is manifesting Himself through the ability of the players on the pitch. We can just be grateful to be able to witness a drop of Krishna’s glory manifesting through the feats of the players — no matter which team wins. The Bhagavatam (10.90.48) reminds us that Krishna is the “ultimate resort of all living entities,” and that He is “all glorious and happy.” Therefore if we remember Krishna when watching the games, we remain unaffected by the results of who wins and who loses, and we can instead marvel at Krishna’s glory that manifests through the football players — regardless of who raises the golden trophy.